and The World of Suzie Wong – and inspiration for classics such as Blade Runner. But Hong Kong’s neon signs are starting to vanish, which has prompted the city’s future museum of visual culture, M+, to launch an online exhibition dedicated to the city’s neon heritage. Mobile M+: NeonSigns.HK goes live today and will be continuously updated over the next three months. That is a situation M+ hopes to redress. 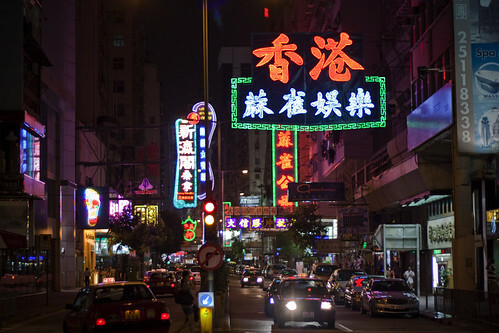 NeonSigns.HK includes a video documentary about neon signmaking, a crowd-sourced map of neon signs and contributions from cultural luminaries like photographer Wing Shya and cinematographer Christopher Doyle. There will also be a series of real-world events over the next three months, including nighttime bus tours, workshops and self-guided audio journeys through Hong Kong’s neon landscape. 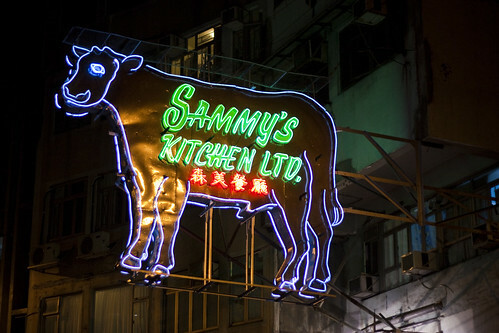 Chen says the catalyst for NeonSigns.HK was the iconic cow-shaped neon sign outside Sammy’s Kitchen, a family-run steakhouse on Queen’s Road West. Though the sign has loomed over the street since 1977, its removal was ordered last year after the government’s Buildings Department found it contravened local building codes. Neon lighting was invented by French engineer George Claude, who exhibited the first electrically-lit neon tube in 1910. It exploded in popularity after Claude introduced the technology to the United States in 1923; by the 1950s, cities around the world were filled with a riotous array of neon signs. Their popularity waned in the 1970s as they became increasingly perceived as tacky and outdated, but in recent years, many cities have sought to preserve what is left of their neon heritage. Some, like Vancouver, have instituted official programs to restore old signs and encourage the proliferation of new ones. That appetite for brightly-lit signage hasn’t changed, but the availability of cheap LED signs has prompted many business owners to scrap their relatively more expensive neon. (Rising rents and redevelopment have also taken their toll as many long-standing, neon-lit shops have closed down.) 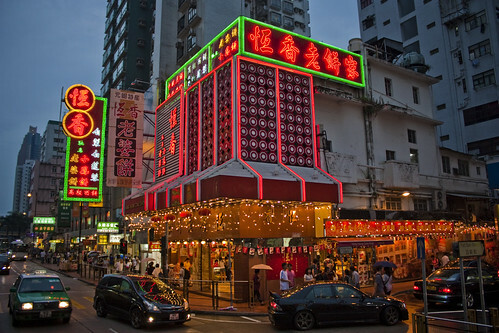 In the past two years, a number of landmark neon signs have vanished, including the Yue Hwa Chinese Products sign in Jordan and the Hang Heung Cake Shop sign in Yuen Long. Chen says neon’s appeal lies in the way it is “caught between the past and the future,” something that is especially evident in Ridley Scott’s 1982 film Blade Runner, in which neon represents a society that is at once technologically advanced yet seedy and debauched. “But we really want to take the discussion beyond nostalgia, collective memory and local identity, and really look at these signs as examples of visual culture,” says Chen. Among the topics touched on by the exhibition are the various typefaces and forms of calligraphy used in neon signs. 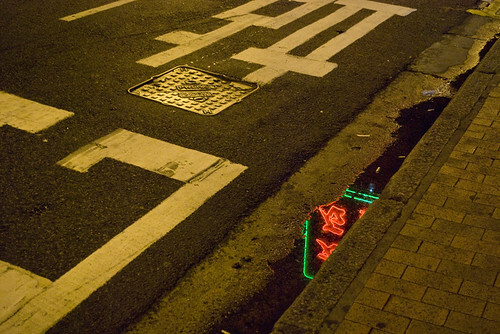 “In Hong Kong there are few visual mediums as compelling as neon signs,” he says. 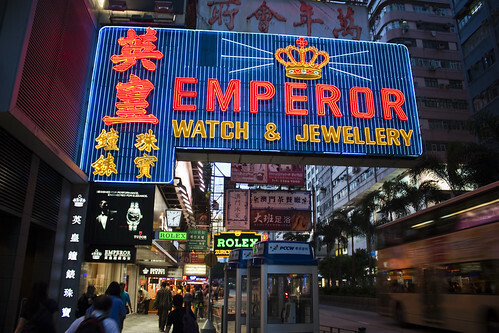 This entry was written by Christopher DeWolf , posted on Thursday March 20 2014at 11:03 am , filed under Art and Design, Asia Pacific, Heritage and Preservation, History, Public Space and tagged Exhibitions, Hong Kong, Kowloon, Neon, Signage, Signs . Bookmark the permalink . Post a comment below or leave a trackback: Trackback URL.